Looking for a unique and useful gift for a friend or special paddleboard someone this holiday season? We've got some great gift ideas for the paddleboarders in your life. Check out all our paddleboard accessories for more great stocking stuffer and other gift ideas. SUP Suction Carrier: Paddleboards are big and bulky and can be tough to transport to water for anyone. This SUP handle secures to SUPs by suction force, making it that much easier for anyone to get their paddleboard wet. You can place it anywhere on your board you want, so it's customizable to fit your reach. Also doubles as a great way to pull your SUP on a wheeled cart or dolly. SUP Yoga Mat and SUP Anchor: If you know a SUP yoga enthusiast, surprise them with a SUP yoga anchor or mat, or both! The anchor keeps your SUP in place and allows you to focus on your yoga practice, and not the location of your paddleboard. Everyone uses a yoga mat on land, so why not get one for your paddleboard on water? The SUP yoga mat and anchor are no brainers. Namaste! SUP Coozie: Most people don't drink enough water a day. 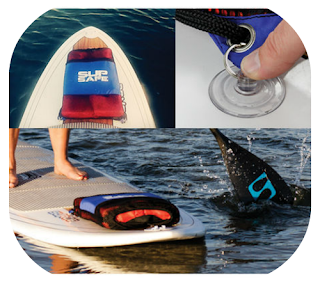 Help your paddleboarder pal stay hydrated on the water with the SUP coozie. Simple but effective, the coozie attaches to the deck of a paddleboard by suction cups, so you can travel with your (reusable!) water bottle, whether it's a distance race, a SUP yoga session, or a casual paddle. SUP PFD Kit - Life Jacket and Whistle Set: It's true! In many places you're paddleboarding, you need to comply with the rules of the water, including having a life jacket and noisemaking device on board your "vessel". Save your friend or loved one a ticket by hooking them up with a personal flotation device kit that includes a life jacket and a whistle. The kit attaches to the deck of a paddleboard with suction cups, so it's simple to set it up and hit the water worry-free. SUP Lock: Yeah, we hate it too, but people are out there looking to lift your paddleboard. A simple paddleboard lock should deter thieves and save you a really bad day. 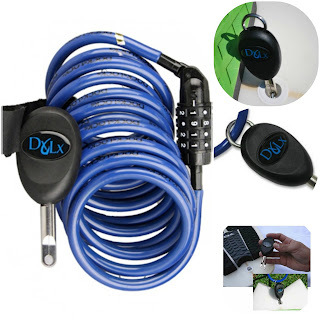 The concept on this lock is like a bike lock - the jaw clamp attaches around your leash plug and you loop the coil around a stationary object like a tree, dock, etc. Use in your backyard, at your dock, or on your car's roof racks. Easy combo lock - no keys necessary.